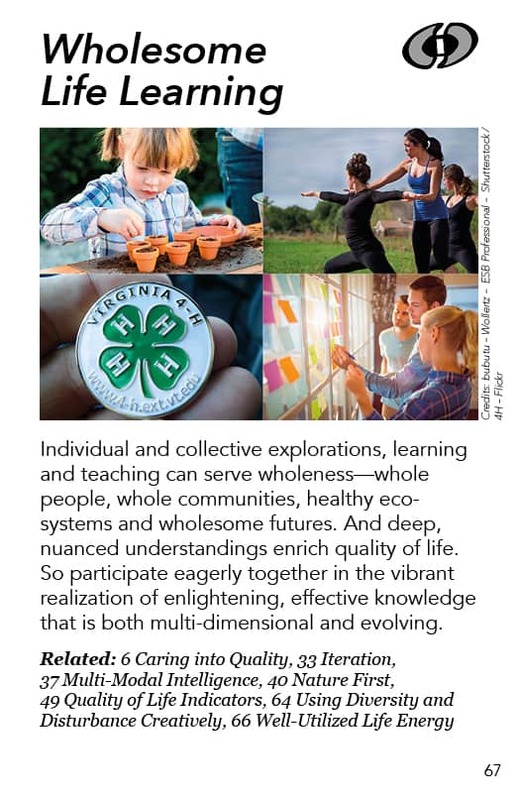 Individual and collective explorations, learning and teaching can serve wholeness—whole people, whole communities, healthy ecosystems and wholesome futures. And deep, nuanced understandings enrich quality of life. So participate eagerly together in the vibrant realization of enlightening, effective knowledge that is both multi-dimensional and evolving. It’s interesting to think of the learning enterprise as being something that happens not only in individuals and but also in collectives – in groups, organizations, communities, countries. There is a whole field of organizational consulting based on organizational learning. How does an organization learn? People flow through it and they learn, but how does IT – as an organization, as an entity – learn, remember, solve problems, etc. So I include in this pattern the individual’s explorations, learning and teaching, and also the collective’s explorations, learning and teaching. And we want all of that to serve wholeness, the whole person, the whole child, the whole community. We want communities to be healed and healthy and all participating together in making a good life for the people who live there. This also is about healthy ecosystems – the wholeness of the ecosystem – and also about wholesome futures. Whatever we are learning in our wise democracy, whatever we are teaching, whatever we are doing, whatever we are exploring, we have this wholeness and wholesomeness in our minds, our hearts, our spirits. That is what we’re going for. So often in our current culture the idea is that you are being educated into an ideology, or you are being educated for a job, or we’re giving you our culture so our culture can maintain itself against the onslaught of other cultures. These are all justifiable – if limited – goals for education and for lifelong learning. A current rationale for lifelong learning tells us to make sure that when we lose a job, we get retrained for a new job. But that’s not the essence of what’s going on in a wise democracy. A wise democracy is looking at the wholeness of things and what kind of learning is involved in maintaining and supporting that wholeness. What do people need to know – and at what levels of their being do they need to know it – in order to serve their own wholeness and the wholeness of the world around them? So we are seeking deep, nuanced understandings. We are not interested in shallow sloganeering. We are not necessarily interested in knowing who said what about what. Again, all those things have their place. But the essence of what we are trying to do when we are designing education systems and activities in or for a wise democracy – whether we are pursuing personal inquiries or group explorations – is we’re trying to understand at a deep level what will enrich the quality of life for all life. It’s like we want our children, we want our communities, we want our cells to understand what’s needed to create a good quality of life together and a good quality of life for generations to come after us. That’s wholesome life learning. It includes lifelong learning because things always change. So we need to continually learn, that’s what learning is basically about. It is about gathering what we need to understand that is appropriate now, but not to stop there. What we learn for today may or may not be appropriate tomorrow. If it’s not appropriate tomorrow, we need to notice that and learn new things. Furthermore, the learning itself is wholesome. The products of that learning and the application of that learning are all wholesome. And the wholeness of the entities that are learning is a major factor in how we go about it, so that’s wholesome, too. We’re also aware that knowledge is not just one thing. There are so many levels and ways we can know something: In our minds we can know facts and principles, we can know things in our hearts and in our bodies, we can know things in deep intuitive ways, and in our souls or spirits. There are so many levels of knowing. Knowledge is not just a bunch of facts that can be spouted out. Knowledge is multidimensional, just as we are multidimensional and reality is multidimensional. Knowledge – true knowledge – is also constantly shifting, because reality changes, we change, society changes. The context we live in is always changing. So how do we move ahead in our learning? How do we create educational systems and activities? How do we create social learning through democratic activity, through dialogues and deliberations, through information exchanges that operate both on those multiple dimensions and with a recognition of the ongoing evolution of knowledge and what we need to know? How do we do all that? That’s the big inquiry this pattern is addressing. And because we know the magnitude of that challenge, we know that in order to cover the ground, we need each other. We are going to be learning from each other, we are going to stimulate each other when we discover new things, new questions, or new situations from each other. That’s part of the unfolding of knowledge, of holistic knowledge and holistic learning. The culture we want to live in is a wise democracy. We are assuming we can build it and we know pieces of it exist here and there already. We can imagine what it would be like if it existed everywhere in a society. And if that were true, we would see people participating eagerly together, realizing in this very alive and vibrant way this learning, this knowledge, and bringing this knowledge into being. We would see people actively learning with all kinds of curiosity and engagement. We would see that aliveness and we’d know that it has something important to do with the quality of their lives. To have high quality learning or high-quality exploration, we need to be able to pursue the inquiries that we are personally passionate about, and to be with other people who want to learn and know and explore in those realms. And that’s part of having a high quality of life. So we recognize that and we provide opportunities for that. Pattern languages themselves are products of particular kinds of inquiry. In creating or using a pattern language we are looking for wholeness in a particular field and what are the elements that go towards making that whole, making whatever it is into a wholesome enterprise that supports wholeness in ourselves and in our lives. That’s what a pattern language is all about – the creation of a pattern language, the application of a pattern language, the using of a pattern language as a structure for learning deeply about each pattern or the whole language, or finding new or particularly resonant patterns. If you find certain patterns appeal especially to you, that means that you have that role in the larger wholeness the pattern language is seeking to generate or describe. So pattern languages themselves, including this pattern language for a wise democracy, are manifestations of – and supports and vehicles for – this kind of wholesome life learning. A pattern language-based curriculum – Looking at a pattern language for a sustainable economy, I once thought, “Boy, you could pick your major to be a particular pattern or set of patterns and then the related patterns would be your minor, and your general education would be the whole pattern language.” What would it be like to have a curriculum like that and to be able to connect up with people who are specializing in the same or different parts of the pattern language? When you are working on your pattern you know the connected patterns and therefore you know who you need to work with. So there is a way of organizing your life and organizing social change or transformational activities using a pattern language and learning on the go. You will be bumping into people who are both within your pattern and working on related ones. Having pattern language-based learning and teaching is just filled with possibilities. Waldorf, Montessori, and Sudbury schools – These are famous school traditions that are trying to actively and realistically engage children in ways that are more life-serving and whole. Chrysalis is a private school in California that is based on engagement with nature. They teach math, science, writing and reading and all the other subjects through engagement with nature. Then there is the active learning, the experiential learning of getting your hands dirty, where you live into the subject matter rather just hearing a teacher talk about it or reading theory. 4-H Clubs – 4-H stands for head, heart, hands, and help – which provides a pretty holistic framing. The 4-H movement started I believe in the United States about 80 or 100 years ago. It was based in helping kids learn how to be healthy successful farmers, but it has expanded to include kids from all kinds of populations and to countries around the world. 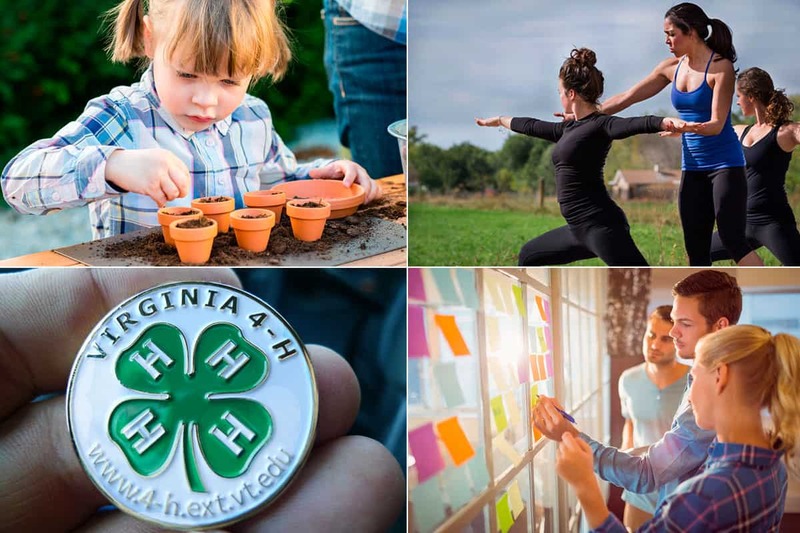 There are millions of young people – kids up to youth – who are engaged in 4-H’s version of holistic, experiential, active hands-on learning. Eco-pedagogy is an emerging field. It proposes that all learning should help us understand how to become partners with the natural world. So there are all sorts of ways to learn. When you actually need to learn certain specific skills and facts, the Khan Academy is useful, even though it is not open-ended and exploratory. It is designed to teach specific knowledge while allowing students to learn at their own speed and to help each other in specific ways. Even open-ended education includes some specific things we need to learn in order to do other things. And the Khan academy excels in helping us do that. Of course, apprenticeships are invaluable for building skills. You are helped to learn by helping somebody who knows and is already a master of the skill or area of knowledge you want to learn. Now we move beyond educating individuals to the larger social realm and explore the question “How does a community or society learn?” Deliberative democracy is a key piece of this, addressing how a society learns about the issues it needs to deal with. I would like to add to the traditional deliberative democracy vision and field the idea of iteration. When we deliberate on a particular subject, we can get very educated about it and do good work in that area. But then things change. We need to include in our deliberative democracy visions and concepts the idea that we deliberate again and again, adding the output from one deliberative activity into another deliberative activity. So that’s one way a community or society can learn over time as conditions change, just as an individual does. Open Space and World Café are designed to mix-and-match people in ways that explicitly use their diversity to share and expand their understanding. People are always learning in Open Space and in World Café and in Dynamic Facilitation. They are all different processes and they offer learning opportunities in different ways. It is extremely hard to walk out of an Open Space, a World Café or a Dynamic Facilitation session the same way you walked in. These are all designed to draw out, stimulate and nudge you in open-ended, learningful ways. We can also say that science is a major way societies learn. But to be wholesome life learning, our sciences need to be socially and ecologically responsible. Our science cannot be just an isolated inquiry to find out whatever we want to learn in order to have the power to win against the larger world, against nature, against reality or our opponents. We need to learning things that will allow us to be more whole, to be in a more wholesome relationship with each other and with life. So that direction in science, that particular kind of inquiry fits very well in the concept of wholesome life learning.